The same bottle of hydrogen peroxide in your first aid cabinet can be used throughout the house and in the laundry room to whiten whites, brighten colors, remove stains and odors, and clean and disinfect your washer. 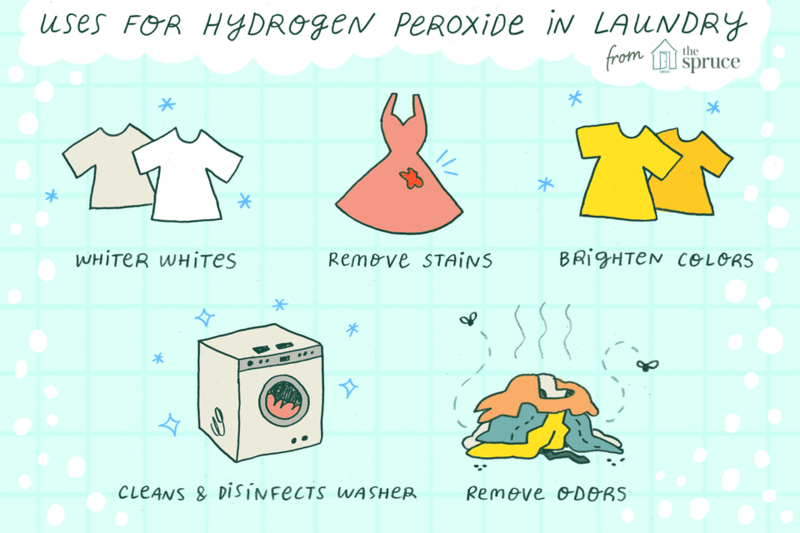 Hydrogen peroxide (H2O2) is an oxidizing agent that can be used as a laundry bleach. The three-percent solution sold in drug stores as a first aid disinfectant is the best choice for laundry as well. It is safe to use on all washable, dye-stable fabrics. Just like other oxygen-based bleaches, hydrogen peroxide breaks down safely into water and oxygen and is a more environmentally-friendly bleach than chlorine bleach (sodium hypochlorite). Hydrogen peroxide is extremely light sensitive which is why it is sold in dark containers. Since it will lose its cleaning ability if transferred to a clear container; just add a spray nozzle to the bottle to make it easy to use for spot cleaning stains. It is most effective when freshly opened and will still provide cleaning and disinfecting qualities for about six months. Eventually, the hydrogen and oxygen molecules will revert into a bottle of plain water. An unopened bottle of hydrogen peroxide has a shelf life of at least one year. Shop for container sizes that will best serve your laundry routine. If you're not sure how old your bottle is and if you'll get the best results for your efforts, test hydrogen peroxide first before using. Simply pour a bit into a glass cup and if it fizzes, you're ready to go. No fizz? Buy a new bottle. Never mix hydrogen peroxide with household ammonia, chlorine bleach or vinegar in a closed container because dangerous gases can form. You're also wasting your money if you use both hydrogen peroxide and chlorine bleach in the same wash load. Combining the two will not double the whiteness of dingy laundry. The sodium hypochlorite of the chlorine bleach is a much stronger oxidant and immediately breaks down the hydrogen peroxide into just plain water. Opt for one or the other in each load. White clothes become dull and yellowed over time due to exposure to body soil, dye transfer from other fabrics, and residue from excess laundry detergent and fabric softener that gets trapped in the fabric fibers. Since most commercial oxygen-based bleaches are composed of ingredients that break down into hydrogen peroxide along with some brightening additives, you can use three-percent hydrogen peroxide instead. Simply add one cup of hydrogen peroxide to the washer drum before adding water or clothes. The hydrogen peroxide can also be placed in the automatic bleach dispenser of the washer where it will be dispersed into the wash cycle. Hydrogen peroxide is also quite effective in removing ugly yellow underarm stains from white clothes when combined with baking soda and water. Hydrogen peroxide is a very effective stain remover for protein and plant-based stains and works well in treating mildew, blood, berry or fruit stains, vegetable stains and dye-transfer stains. Even though it is a very mild form of bleach, it is best to test hydrogen peroxide on colored clothes in an inconspicuous spot (hem or inside seam) to make sure the colors don't fade. Just dip a cotton swab in the hydrogen peroxide and rub it on the fabric. If color transfers to the swab, don't proceed. To treat stains, pour or spray a small amount of hydrogen peroxide on the stain and allow it to soak into the fabric for about ten minutes before washing the garment as usual. High-efficiency front load washers are notorious for developing smelly odors, especially in high humidity areas. The odor comes from mold and mildew growth on detergent and fabric softener residue left inside the washer drum and on rubber door seals due to overdosing. When your washer needs a cleaning, add two cups of hydrogen peroxide to the empty washer drum and then run a hot water wash cycle. Your washer will smell fresh and clean. A monthly cleaning will usually prevent a stinky repeat. Colored clothes can become dull from body soil and detergent residue trapped in the fibers. You can brighten them with the mild bleaching action of hydrogen peroxide. Remember, never pour full strength hydrogen peroxide directly onto colored fabrics unless you have tested them first for colorfastness. The easiest way to use hydrogen peroxide to brighten colored fabrics is to pour one cup into the bleach dispenser. It will be added during the wash cycle when there is plenty of water. If you don't have a dispenser, dilute one cup of three percent hydrogen peroxide with two cups of water and add to the empty washer drum then load in your colored clothes and wash as usual. Smelly towels? Stinky tennis shoes? Grab the hydrogen peroxide. Simply mix one-half cup of hydrogen peroxide with enough water to completely submerge the smelly items and allow them to soak for at least 15 minutes, 30 minutes is better. Wash as usual. For an entire washer load of musty towels or foul-smelling athletic gear, add one cup of hydrogen peroxide. Give the fabric time to soak (up to an hour) and then add detergent and wash with hot water. Are You Using Laundry Bleaches the Right Way? Is Your Laundry Routine Spreading Athlete's Foot Fungus? Are You Getting The Best Results From Your Washer?